I have a particular fascination for fonts. After all, I'm a Graphic Designer, and I really wouldn't consider myself a very good one if I didn't. And if you see fonts, like I do, you're either a Graphic Designer, or weird, or both. Seeing fonts is part of what I call "seeing structure, not just content". And it applies to all types of design, automotive, architectural, everything. If it's completely invisible to you, don't be surprised, you're in the majority. For the vast majority of people, it's content that matters, not structure. When the average person looks at a poster, they are supposed to be inspired to buy the product, when they see a building, they're supposed to go in there. If most people just stood around looking at posters and admiring the fonts, then their function would be essentially lost. If you're like some people, you can see both. I'm working on getting better with seeing content, but I have to work on it, it doesn't come naturally to me. And I see fonts! Seeing fonts has been a problem for me. Take a look at the photo at the top of this post and tell me what you see. 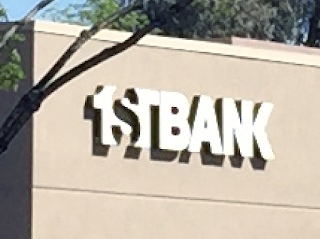 A bank, right? And you may be wondering where exactly this one is, or you may be someone who worked for 1st Bank, or banks with them. You may have had a bad experience with them, or have been delighted with their great service. But look at it through my eyes, I took the photo because of the use of the font. I pondered it for quite a while, enjoying how the negative space had been used, and wondering if I could really call it Helvetica, or if it was a just a modified sans serif font. Nah, look at that K, it's not Helvetica! I do this all of the time, and sometimes if people ask me if there's a bank around, I will say "Bank? I don't recall any bank". The content often doesn't even sink into me. Zoomed in. 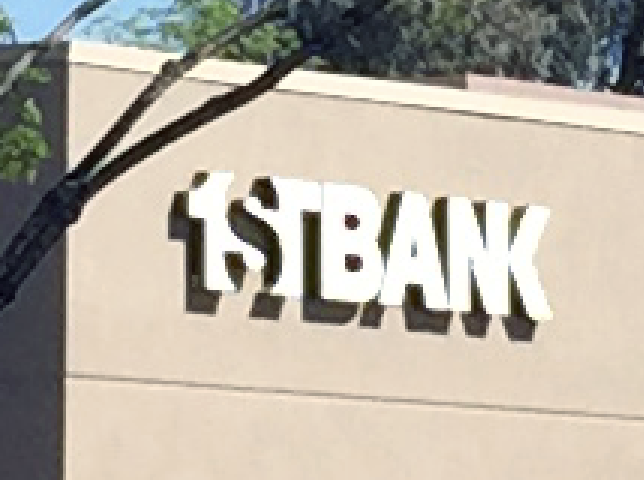 Note how the S is created out of the negative space of the one and the T, and that the back of the K is the last stroke of the N. And this is just one example of millions of things like this I see all of the time. And it gets worse for me, because I'm not just fascinated with fonts, I'm fascinated by all kinds of design. I'll walk around buildings, and people will wonder if I'm looking for the door, or the gift shop, or the restaurant. I could tell them that I'm admiring the way that the art deco design blends so beautifully with the art deco fonts, but I try to just smile, thank them, and walk right up to the door that says, "Restaurant Closed" - probably in Garamond. Or maybe Times New Roman? Image at the top of this post: 1st Bank Branch on the southeast corner of Bell Road and 59th Avenue, Glendale, Arizona. Thank you to my patrons on Patreon who help support History Adventuring! 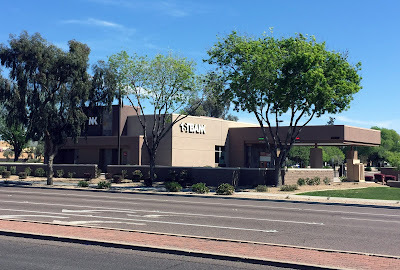 If you like these blog posts, and would like to make suggestions for future ones, please go to patreon.com/Phoenix HistoryAdventuring where you can show your support for as little as $1 a month. Thank you!